Low-cost airline Norwegian has partnered with GetYourGuide, the largest travel activity booking website. Members of the airline’s award-winning loyalty programme, Norwegian Reward, can now reduce the cost of future flights when choosing from nearly 30,000 tourist experiences worldwide. Norwegian Reward is free to join and now has 4.6 million members globally, adding 100,000 each month on average who receive exclusive discounts and offers with Norwegian. Reward members can flexibly spend CashPoints on any Norwegian flight including taxes in addition to checked baggage, seat reservation and fast-track for more seamless travel at a reduced cost. 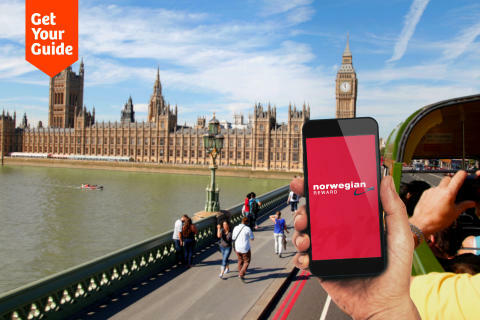 600,000 Norwegian Reward members in the UK can now earn CashPoints by doing the activities they enjoy most when booking tourist activities with GetYourGuide. Whether biking the Golden Gate Bridge in San Francisco or wanting to avoid the lines at the Sagrada Familia in Barcelona, the largest website for travellers to book tours, excursions and tickets to tourist attractions, hosts a wealth of experiences at unmatched prices for holidaymakers. To mark the new partnership, Norwegian and GetYouGuide is offering all passengers using Norwegian’s inflight Wi-Fi the opportunity to receive a 10% discount on any activity. Passengers who register interest for activity suggestions during their flight will receive an email upon arrival at their destination with options to book exciting discounted activities. Norwegian Reward members will benefit from 10% discount on all GetYourGuide activities and double the amount of CashPoints for any activity booked by 6 October, 2016. Eugen Triebelhorn, Head of Business Development at GetYourGuide said: “We are very excited to work with Norwegian Reward, a true innovative leader in loyalty programmes. This partnership allows us to offer amazing local tours and activities to Norwegian Reward members at the most relevant moment of their journey, making their travel experiences truly memorable." Members can also earn rewards on all Norwegian flights which can be used to boost CashPoints, gain free seat reservation, free fast-track or free baggage for a year. The popular loyalty programme was awarded the “Best up-and-coming Award”at the 2016 Freddie Awards - the most prestigious member-generated awards in the travel loyalty industry.